On January 25, PLAAS and TBTI organized a special seminar as a way to encourage discussion about 'Blue Justice' and SSF. The recording of the seminar is available HERE. 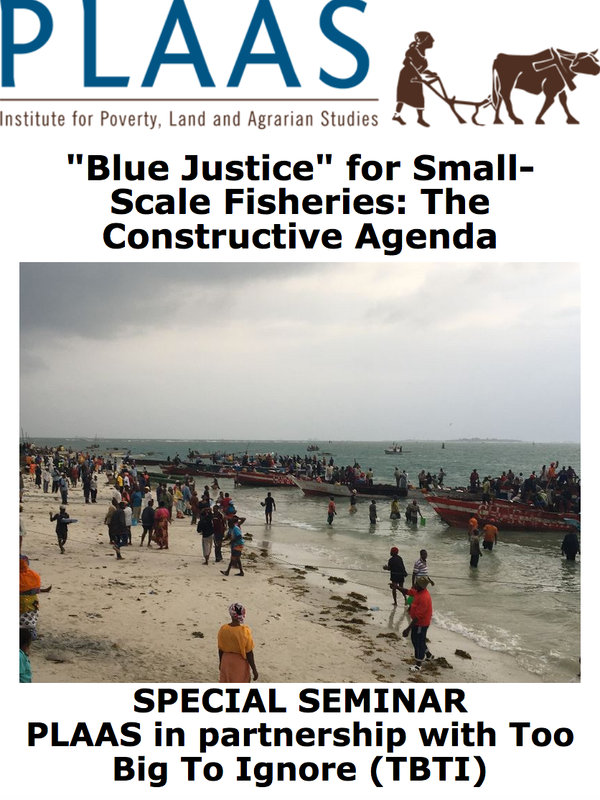 On January 25, Institute for Poverty, Land and Agrarian Studies, University of Western Cape, in partnership with TBTI, organized a special seminar as a way to encourage discussion about the concept of 'Blue Justice' in relation to small-scale fisheries. The seminar also emphasized the need to connect the key international instruments such as the Voluntary Guidelines for Securing Sustainable Small-Scale Fisheries, the Governance of Tenure, and the Right to Food Guidelines, to meaningfully engage with local small-scale fishing communities, in order to secure access, food and livelihoods. The seminar began with presentations by the following TBTI members. It was chaired, and the discussion moderated, by Naseegh Jaffer, of Masifundise, TBTI partner based in South Africa. PLAAS in partnership with Too Big To Ignore invited debates and discussions about the concept of Blue Justice for Small-Scale Fisheries, making it part of the ‘constructive’ agenda for small-scale fisheries, particularly in light of the envisaged International Year of Artisanal Fisheries and Aquaculture in 2022.